A no bake chocolate cheesecake made with an oreo cookie crust, dark chocolate, mascarpone cheese, marshmallows and a hint of coffee. It’s rich, velvety and completely indulgent. This easy no bake cheesecake requires very little effort and is completely foolproof! Because we all love a little chocolate from time to time, right? I am a HUGE fan of no bake desserts. I love the creamy texture, the little effort that’s usually involved and the big flavours. No bake in my opinion means a recipe that does not require an oven and is relatively easy to make. If it means melting some chocolate and butter over a stove then that is totally fine with me. I’m calling this a no bake chocolate cheesecake but there isn’t any cream cheese involved. However there is mascarpone cheese that’s folded in at the end and a special ingredient that I just LOVE. Marshmallows! The marshmallows melt into the chocolate and create a vanilla scented, thick and indulgent chocolate filling. It’s SO damn delicious, and because we love all things Italian, I added espresso into the mix which gives it a nice kick. Tip: If you don’t like coffee or would rather not add it then just replace it with water. This will give you a delicious, intense chocolate flavoured cheesecake. I’ve tried it both ways and they are both as equally delicious. First, melt half of the butter in a saucepan and add oreo cookies to a food processor (whole cookies including the white filling). Blitz the cookies to a fine crumb whilst adding the melted butter (photos 1 & 2). (affiliate link) and press it firmly with the back of a metal spoon to create a smooth, even layer. Place it in the fridge while you make the filling (photo 3). Add the cubed butter, marshmallows, chocolate, water and espresso to a large saucepan on a low/medium heat. Stir the mixture until everything has completely melted. When there are only a few lumps of marshmallows left, turn the heat off and add the mascarpone. Stir the marscarpone into the chocolate mixture until combined (photos 4-6). Tip: If there are still a few lumps of marshmallows left then turn the heat back on for a few seconds and stir until melted. Tip: Adding a pinch of sea salt flakes really brings out the chocolate flavour and makes it extra delicious. Remove the chocolate cheesecake base from the fridge and pour the chocolate filling into the tin. Place it back in the fridge to set (photos 7-9). P.S The uneven spaces of frosting around the cheesecake were driving me crazy (top photo) but I KNOW if I tried to correct it I would’ve been left with a big brown, sticky mess (yeah, nice) and I probably would’ve cried. Hope you enjoy and frosting tips are always welcome! 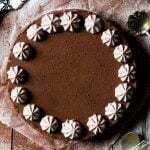 If you’ve tried this no bake chocolate cheesecake or any other recipe on the blog then don’t forget to rate the recipe and let me know how you got on in the comments below, I love hearing from you! You can also FOLLOW ME on FACEBOOK, TWITTER, INSTAGRAM and PINTEREST to see more delicious food and what I’m getting up to. A no bake chocolate cheesecake made with an oreo cookie base, dark chocolate, mascarpone cheese, marshmallows and a hint of coffee. First, melt half of the butter in a saucepan. Add the oreo cookies to a food processor (whole cookies including the white filling). Blitz the cookies to a fine crumb whilst adding the melted butter. Add the crumbs to a lined cake tin (8.5 inch/22cm) and press it firmly with the back of a metal spoon to create a smooth, even layer. Place it in the fridge while you make the filling. 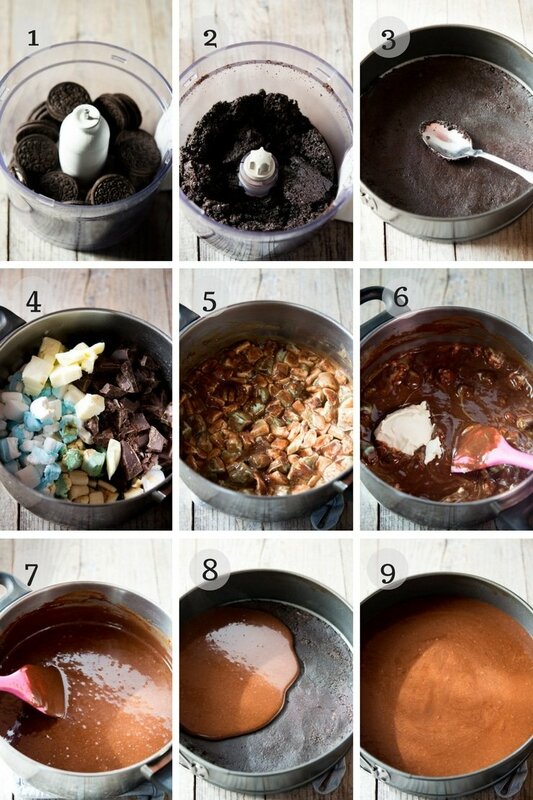 Cut the marshamallows into small pieces and brake up the chocolate into small chunks. Add them both to a large saucepan with the espresso, water and remaining half of the butter (cut into cubes). Melt the mixture over a low/medium heat and stir the mixture until everything has completely melted. When there are only a few lumps of marshmallows left, turn the heat off and add the mascarpone. Stir the marscarpone into the chocolate mixture until combined and add a tiny pinch of sea salt. If there are still a few lumps of marshmallows left then turn the heat back on for a few seconds and stir until melted. Remove the chocolate cheesecake base from the fridge and pour the chocolate filling into the tin. Place it back in the fridge to set for at least 1 hour (preferably 2-3). Dust with unsweetened cocoa powder before serving (optional). Add the ricotta to a mixing bowl and whisk until smooth and creamy. Add the sugar and sieve in the cocoa powder. Mix everything together, taste and add more sugar if necessary. Add the mixture to a piping bag with a large star shaped nozzle. Pipe the frosting around the edge of the cheesecake and serve. Try adding orange zest, mint, vanilla or your favourite flavourings into the chocolate mixture. Replace the espresso with water if you don't want a coffee flavour. Overall time excludes chilling time. Can be frozen. Cut into individual portions before freezing, wrap in baking parchment and place in a sealed container. Let it thaw completely before serving. (these come in a set of 3. They are great non-stick pans that I've used for a long time). *This post contains affiliate links, see disclosure for more info. I love the addition of the secret ingredient…. marshmallows are my personal fave! What a great treat this will be for Valentines day! This is probably the best looking thing I’ve seen in forever! I love the addition of marshmallows to this cake! Genius! Thanks so much Marlee you’re so kind! Love this chocolate cheesecake with mascarpone and coffee. Looks delicious! Thank you so much Natalie, that’s so kind of you! As a non-baker, this looks like such an easy recipe to execute and the outcome looks so delectable! Aw thanks so much Marie, that’s so nice of you! 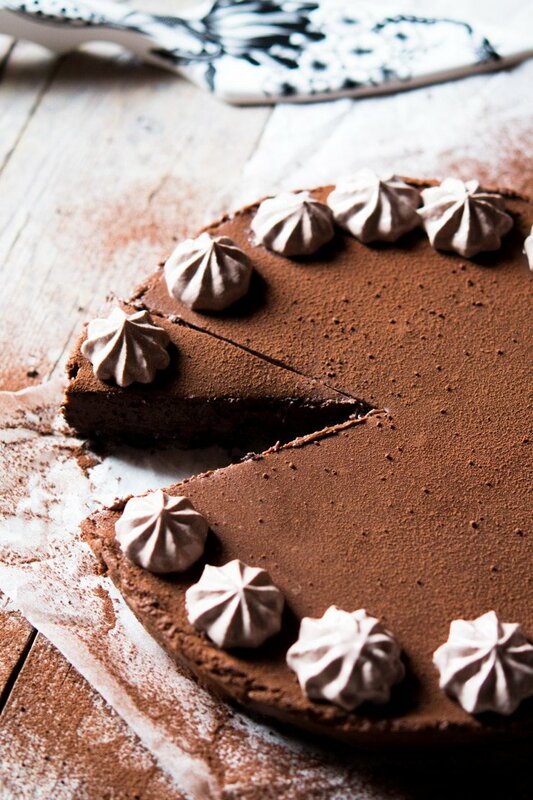 Cheesecake is one of my favourite desserts and this chocolate one looks right up my street! Thanks Amy, it’s one of my favourites too! 😍 You had me at Oreos and mascarpone cheese. I LOVE cheesecakes made with mascarpone cheese. Definitely going to try this recipe ASAP. Thanks Britt, I hope you enjoy! 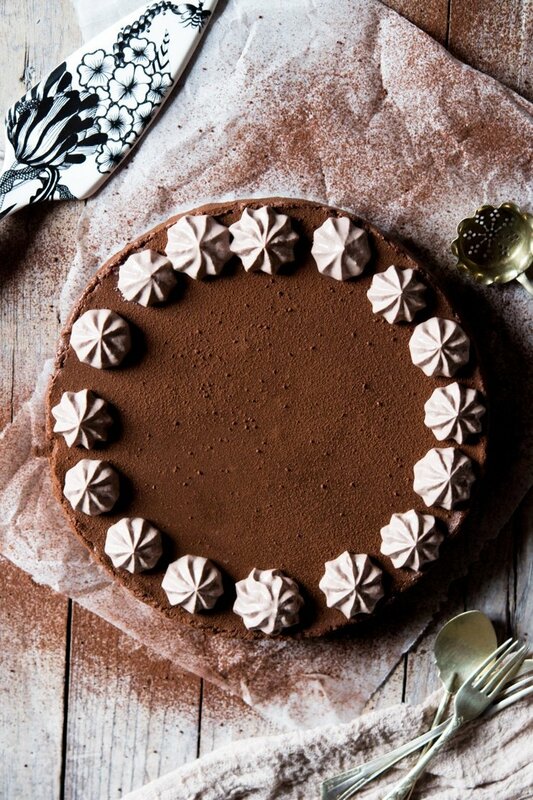 Wow, this looks so easy, and so intense – like a mocha cheesecake. This looks divine. My daughter and I love chocolate. I think I will make this as her special treat for getting such good grades. Thanks for the fantastic recipe! Aw that’s so nice, I hope you both enjoy it!